Santo Domingo, Dominican Republic – The Global Foundation for Democracy and Development (GFDD) and its sister organization in the Dominican Republic, la Fundación Global Democracia y Desarrollo(Funglode) will host a conference on “Creando el futuro un estudiante a la vez” (Creating the Future One Student at a Time) led by Dr. Miguel Martínez-Saenz, the President of St. Francis College in Brooklyn, New York. The President of St. Francis College bases much of his leadership on the belief that learning is more valuable when teachers and students can connect and understand one another. For this reason, St. Francis College has a maximum of just 22 students per classroom. Dr. Martínez-Saenz, a former Fulbright Scholar with the Fulbright-Nehru International Education Administrators Program, will speak about his dedication to personalized education as well as his experience as the President of one of the top US institutions of higher learning in New York City and all of the Northeast United States. 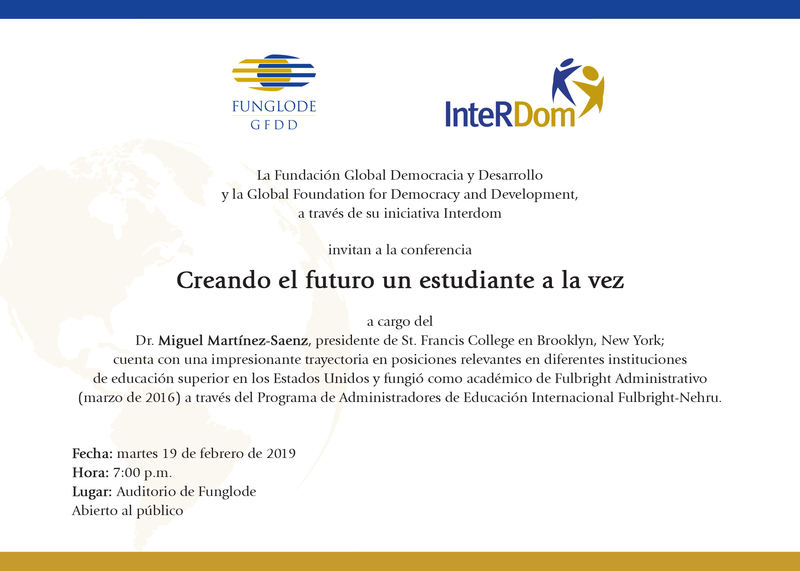 All are invited to attend this free event which will take place at 7:00PM on Tuesday, February 19, 2019 in the Funglode Auditorium in Santo Domingo, Dominican Republic.